Happy first day of Fall!!! I can officially say that my favorite season is here! Crisp mornings, cool breeze in the air, rainy days, red and orange tree lined streets, the fire place lit in the evening and lots of fun new things to make! As you guys know I love breakfast, and it doesn’t have to be fancy weekend breakfast with bacon or pancakes, but a good simple weekday breakfast. 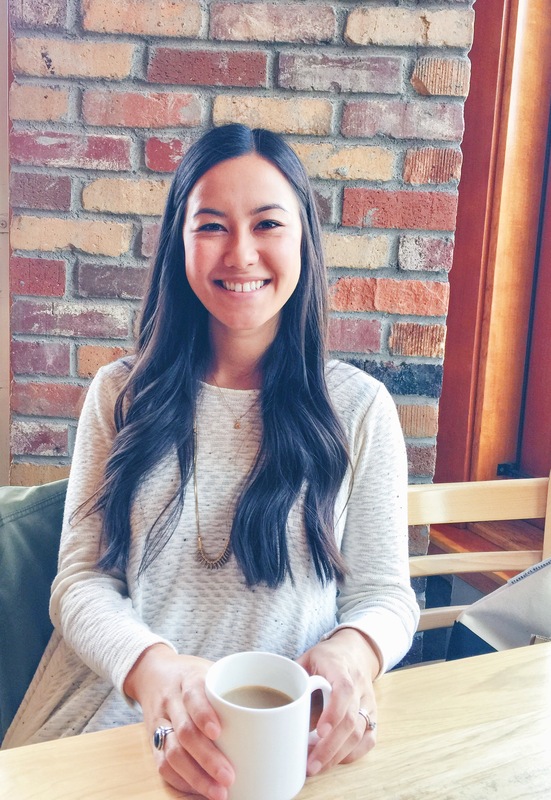 I look forward to waking up each morning, having a cup of coffee and eating one of my favorite breakfasts while I work at my desk. 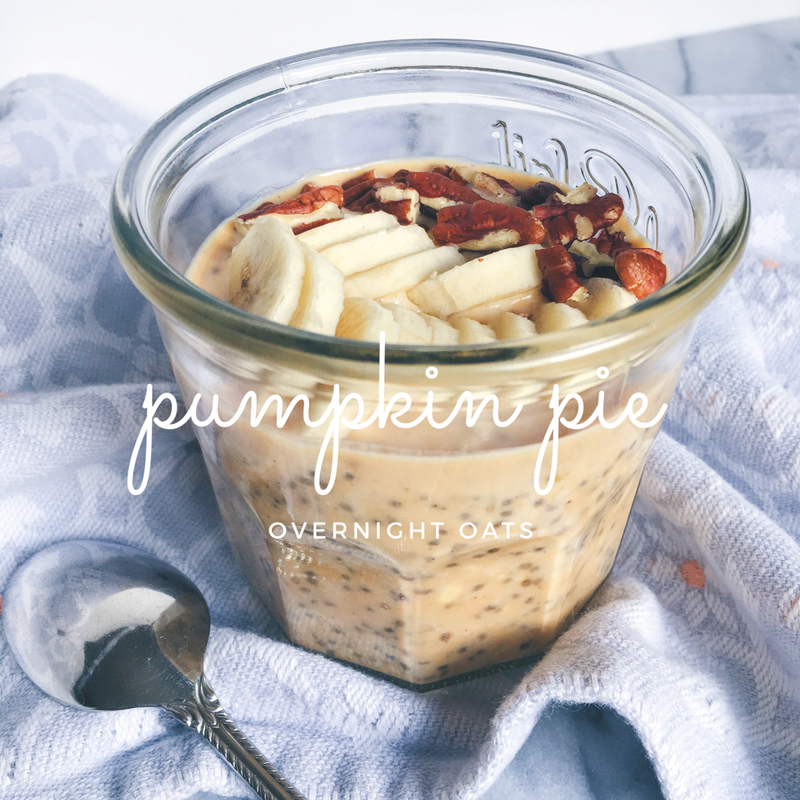 I usually eat the same breakfasts on repeat and this Pumpkin Pie Overnight Oats recipe has made it into the rotation the past few weeks. Fall morning are the best because I can have the window open letting the fresh air in, be in comfy jammies and stay warm without having to be bundled up with a space heater under my desk and wearing layers on layers like in winter months. 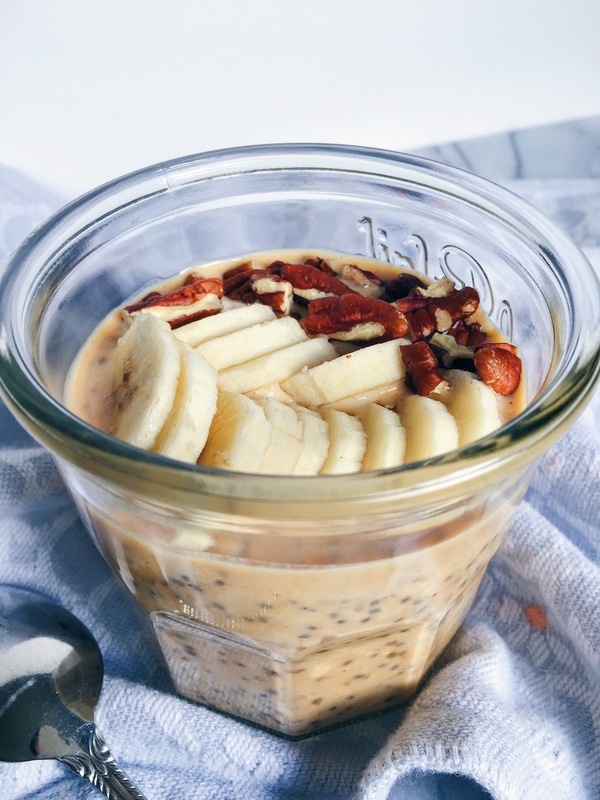 These overnight oats make my morning more productive because I whip up a jar the night before or at the beginning of the week and when I’m ready add some fresh sliced bananas or whatever toppings I’m feeling for the day and dig in, it’s that easy. 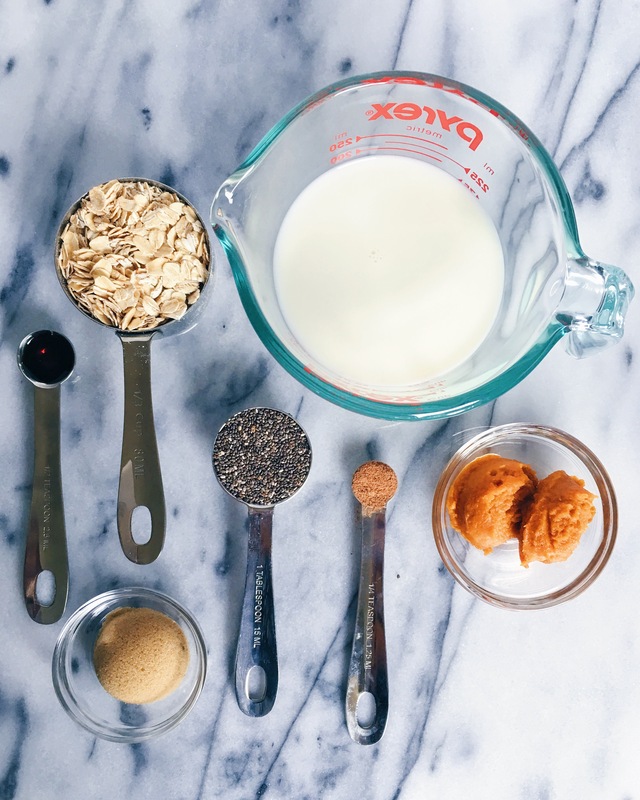 The pumpkin puree, brown sugar and spices make this overnight oats recipe next level for the perfect fall breakfast! Like I said this is so simple to throw together the night before or at the beginning of the week to be enjoyed any morning you’re in a hurry or needing a deliciously comforting breakfast. All it takes is putting these ingredients into a container, giving them a good mix, covering them and sticking them in the fridge overnight. In the fridge it goes, and out comes your overnight oats in the morning. 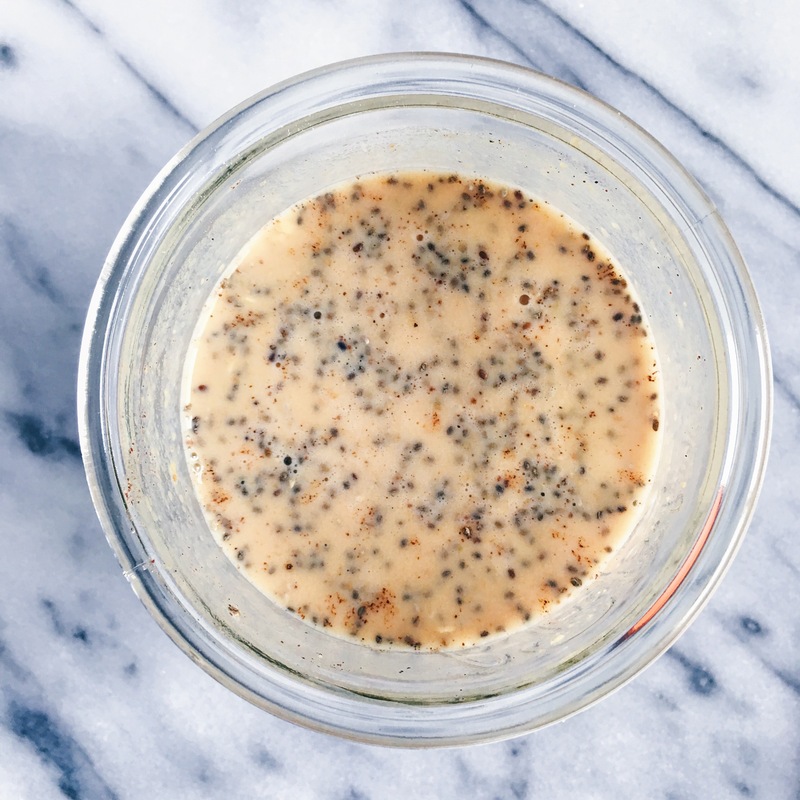 The time spent in the fridge does the heavy lifting for you, the oats become soft, the chia seeds help to thicken the mixture and the flavors get real cozy together so by the time morning comes, it’s ready for you to enjoy. Top with your favorite fixins like bananas, nuts, more brown sugar, heck why not even some whipped cream like a real pumpkin pie experience. You do you! In a jar or container with a lid combine all ingredients and give a good stir or shake. Refrigerate overnight. When you’re ready to eat, you can enjoy hot or cold. If you’d like it hot pop it in the microwave in 30 second increments, stirring between, until it reaches your desired temperature. 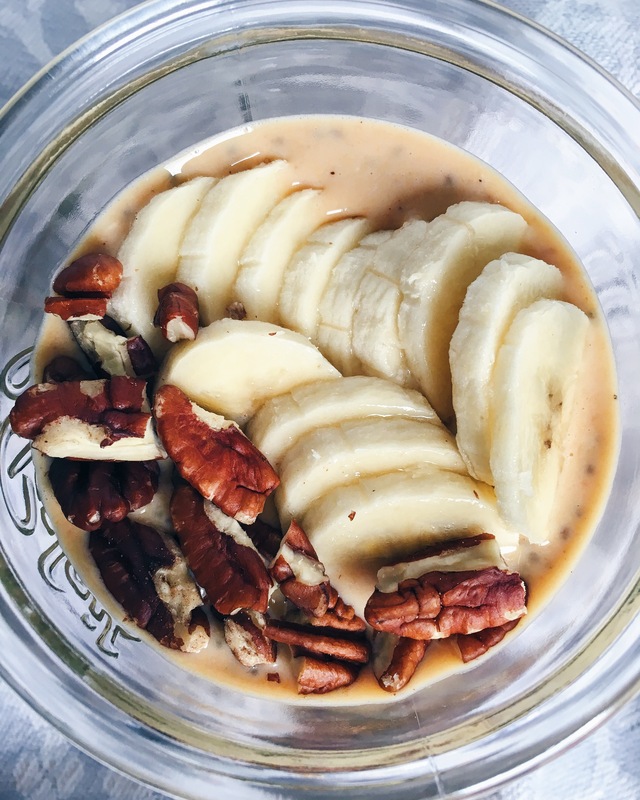 Add your favorite toppings such as banana slices, nuts, brown sugar, more spices, or whipped cream for fun! 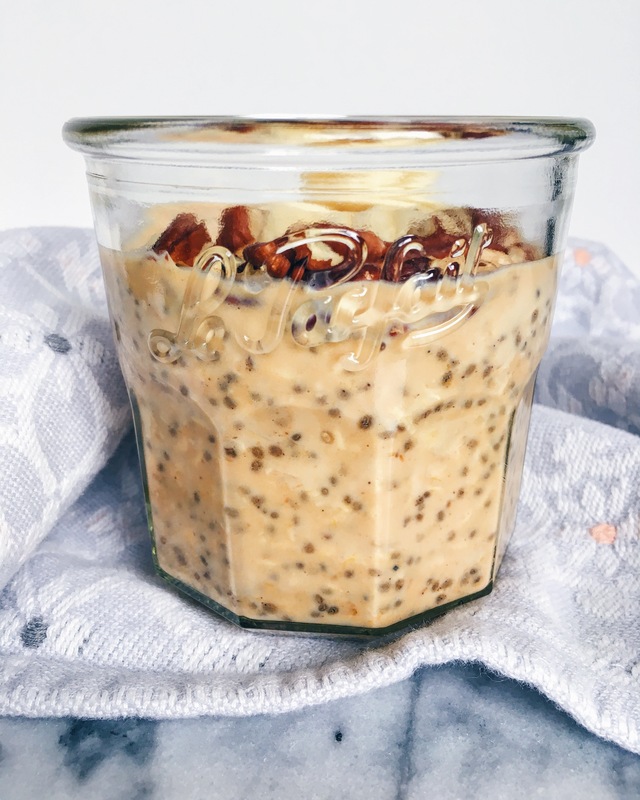 Overnight oats can be stored in your fridge for up to a week. I tried all 3 spices separately and loved them all, it is totally up to you which to use, or you could try a combination of all 3. Next > My parents were here!